Can the Ducks Prove They’re More Than a One-Man Show? Welcome to the most wonderful time of the year. College football is finally back! After months of mundane Saturdays, we have a full slate of college football games to digest again. The Ducks got their much-anticipated season debut out of the way, with a 58-24 victory against Bowling Green. But there were a few issues. The box score shows that the Ducks won easily. Nevertheless, the Ducks displayed some troubling flaws that let a team hang around that had no business hanging around. That could spell trouble moving forward, . How Did the Ducks Look? 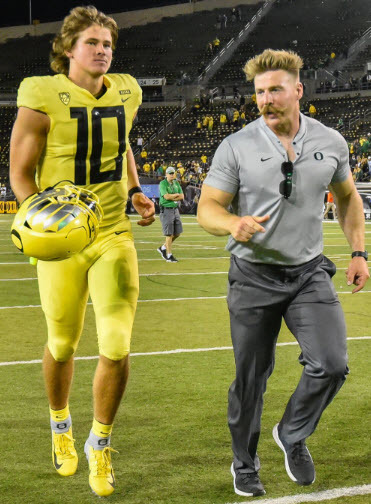 The Ducks didn’t exactly put forth a dominating performance in Mario Cristobal’s opening game debut. It may have been rust from the off-season, or maybe they’re still getting acquainted with the new leadership. But they didn’t look nearly as potent as one might have hoped, playing against a significantly overmatched opponent. 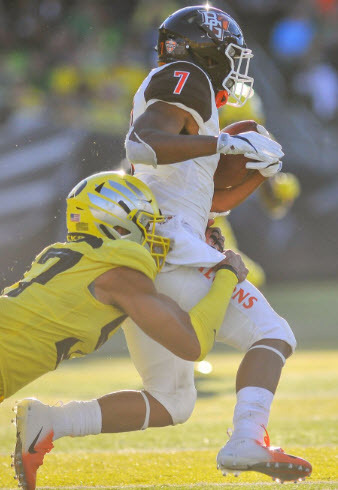 The Ducks had a tough time slowing down the Falcons’ running game at times on Saturday. The defense summoned horrific memories from 2016, as the Falcons often ran easily through the Oregon front seven. When the Ducks were finally able to corral the Falcons’ elusive tailbacks, Bowling Green turned to wide receiver Scott Miller. Miller responded by setting a career high in receptions with 13, along with 166 yards and two touchdowns. He torched just about every member of the Ducks’ secondary at least once during his performance. The Ducks’ defense still has a lot to work on. Offensively, the wide receivers also left much to be desired. There were drive-killing drops, lackadaisical routes and an overall lack of effort on numerous plays. These shortcomings reared their heads at the most inopportune times, often killing any momentum the Ducks had begun to build. The running game was solid, if unexceptional. It certainly made good on Cristobal’s promise to be more physical, but so far that has come at the expense of explosiveness. With the longest run by a Ducks’ running back totaling just 15 yards, those game-shifting breakaway runs that were so prevalent under Oregon’s former offensive schemes could be in danger of becoming a distant memory. Of course there were bright spots, too. The Ducks put up 58 points — a significant accomplishment, although fans have begun to take scores like this for granted. Additionally, the emphasis on reducing penalties seems to have paid off. The Ducks were only penalized three times all game, and it was refreshing to not have big plays called back because of undisciplined play. And there was one player who clearly elevated his game and got his season off to a stellar start. The most positive takeaway from week one was the brilliance of Justin Herbert. The junior quarterback was simply on another level. If his week one performance is any indication, he will be among the top players in the country by the season’s end. Justin Herbert was dynamite in his season debut. On the surface, his week one numbers are pretty ordinary. He completed only 10 passes, with just a 47.6 completion percentage and two interceptions. But those numbers say more about the struggles of his supporting cast than his own efforts. 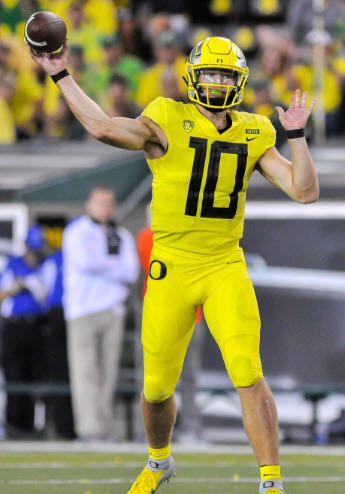 Herbert threw the ball with consistent accuracy to each level of the field all game long, but at least three perfectly placed passes were outright dropped by the Ducks’ receivers, and each of the two picks would have been prevented by a stronger effort on the part of the receiver. Furthermore, of the ten passes that were completed, five were touchdowns, and he threw for 281 yards on those completions — a sign that his attempts were not only meaningful, but explosive. After the Ducks’ first two drives stalled following drops by the receivers, they were down 10-0. 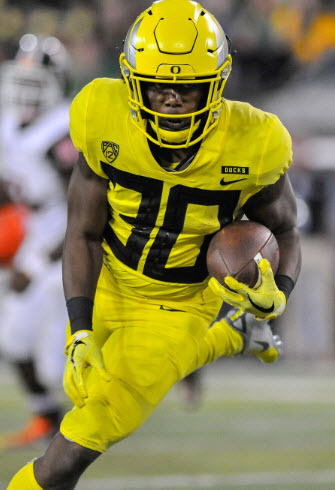 On the Ducks’ third possession, Herbert kept a zone-read and produced an electric 37-yard rush — a spark that the Ducks needed to regain momentum. What followed was the first of six touchdowns by Herbert, as, on fourth and long, he placed a perfectly thrown ball between two defenders for a 33-yard touchdown strike. Herbert’s leadership and command of the offense were on full display. That little master stroke started a 37-0 Oregon run, featuring downfield dimes and precise passes from Herbert. His aggressiveness in the passing game stretched the Falcons’ defense vertically — and, incidentally, had fans out of their seats. It also forced the opposing safeties to vacate the box, which made room for the Ducks’ bulldozing rushing attack. Ultimately, Herbert’s command of the offense inspired the entire team. He bailed the Ducks out of unfavorable situations with his calm, confident demeanor. He ran the offense smoothly and efficiently, and the team rallied around his example. Herbert is clearly the Ducks’ most important player. The offense depends on his success to thrive, and his infectious leadership carries over even to the defense’s efforts. Players like wide receiver Jaylon Redd must use these next two games to continue to improve. As great as it is to have such a player, the Ducks have to find a way to become less reliant on the Heisman-contending quarterback. Although they were able to overcome a sloppy performance against Bowling Green and still win comfortably, they won’t be able to do that against their more talented conference opponents. Luckily, the Ducks have the benefit of a manageable non-conference schedule. It’s the perfect opportunity to get the rest of the team up to speed. If the Ducks are able to work out their kinks and develop more playmakers on both sides of the ball, then they could be in for a big season. 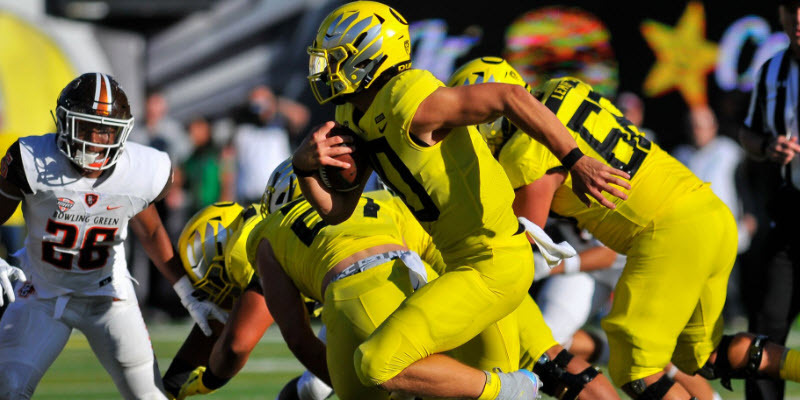 However, if Herbert’s supporting cast continues to perform as inconsistently as they did in week one, the Ducks will have a difficult time navigating their conference slate. Can the team around him improve enough to validate the hype, or will the Ducks be a one-man show in 2018?